The big news for advisors this summer are comments by FINRA CEO Richard Ketchum, urging advisors to warn clients of the growing risk in bonds and fixed income investments. Rather than hiding under their desks, advisors using Riskalyze’s Interest Rate Stress Test feature are turning this warning into a tool to grow and retain business. Let’s take a look at how they’re putting it to work. The Interest Rate Stress Test allows you to apply a specific interest rate forecast to any of the bond holdings in a portfolio, allowing them to easily show prospective clients the effect that rising interest rates could have on their holdings. It also helps advisors make efficient adjustments to existing portfolios under management. Let’s start with preparing for a prospect meeting. 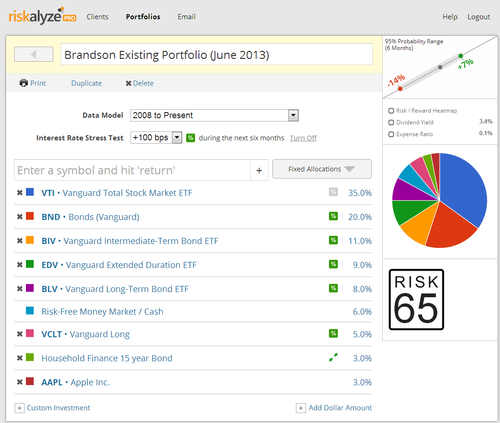 First, the advisor or their administrative assistant enters the prospect’s existing portfolio into Riskalyze. We’ll use the default “Long Term” data model. This prospect has a lot of low-cost ETFs, plus a small position in AAPL and an individual bond they inherited years ago. 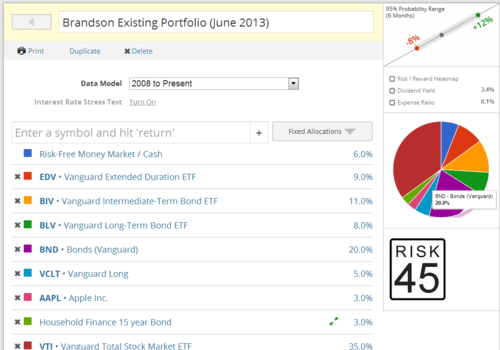 The portfolio’s risk number is 45, with a six month probability range of –8% to +12%. Now, let’s turn on the interest rate stress test. I make sure that the stress test is affecting all of the bonds in the portfolio (by making sure the % icon is green for those funds). And then I set the stress test at +100bps. Riskalyze will then benchmark the risk and return probabilities of each of the bond funds to benchmark against a +100bps increase in the 10-year US Treasury rate, to see what happens to the broader portfolio. The risk number jumps to 65, and the six month probability range shifts down to –14% to +7%. A 1% increase in interest rates increased the portfolio’s net risk by more than 70%. Even if the prospective client knew how much risk the portfolio had under normal conditions (rare and unlikely), seeing that a 1% rise in interest rates has such a dramatic impact on downside risk is often eye-opening. Make sure you’ve added dollar amounts to the portfolio so the prospective client will beg you for transfer paperwork! In our next post, we’ll take a look at drilling down into the portfolio to find out where the interest rate risk is really coming from.